Intelligence officer says incendiary balloons have traveled farther than Be'er Sheva. Police intelligence officer for the Negev Avi Cohen on Tuesday morning spoke about the incendiary balloon which landed near Be'er Sheva's Soroka Hospital on Monday night. 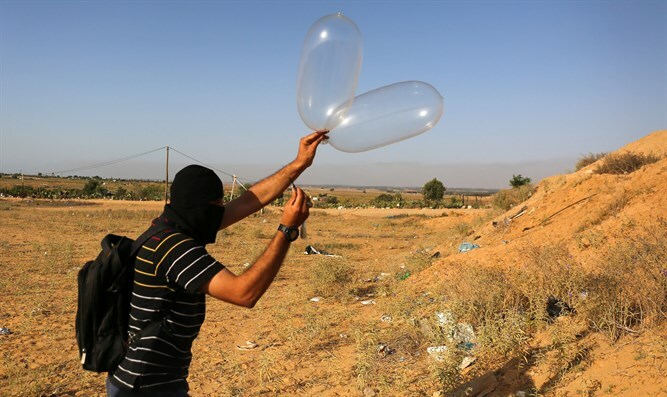 According to Cohen, incendiary balloons have reached much farther than Be'er Sheva. "Our estimation is that they originate in Gaza," he told Army Radio. "We've found incendiary balloons in the Bedouin encampments." On Monday night, incendiary balloons landed less than a mile away from Be'er Sheva's Soroka Hospital. Soroka is the only hospital between Ashkelon and Eilat, serving Jewish and Arab residents of the Negev, Arava, and the Gaza border area.